Last week Apple added some further configuration options for would-be buyers of its MacBook Pro 15 laptops. High end GPU configuration choices used to plateau with the selection of the AMD Radeon Pro 560X with 4GB of GDDR5 memory and automatic graphics switching (to the Intel UHD Graphics 630 iGPU). Now there are options of configuring one of two AMD Radeon Pro Vega dGPUs in this premium laptop. If you head on over to the link directly above you will see the Graphics options facing would-be purchasers of the Apple MacBook Pro 15. As you can see, the new options provide a choice of Radeon Pro 555X, or Radeon Pro 560X, (both 4GB GDDR5) and with the top-end MacBook Pro model (right column) you can reach for the Radeon Pro Vega 16 or Radeon Pro Vega 20 (both with 4GB of HBM2 memory). The number suffix of these Radeon Pro Vega GPUs indicates the amount of Compute Units equipped. 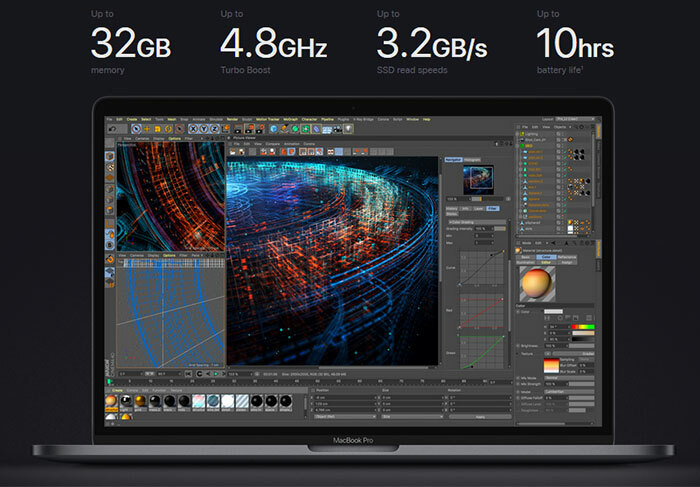 As a reminder of the other key specs of the new MacBook Pro 15, the system comes with a 15.4-inch IPS screen of 2880 x 1800 pixels, users can configure from a hexacore Intel Core i7 to a Core i9 with turbo boost up to 4.8GHz, there's a choice of fast SSD built-in storage from 256GB to 4TB, systems come with 16GB of 2400MHz DDR4 RAM as standard but can go up to 32GB. MacRumours reports that one of its readers has already had the opportunity to test and benchmark a MacBook Pro featuring the top-end choice of a Radeon Pro Vega 20 graphics card. The system also came with a 2.6GHz Core i7 Intel processor, 16GB RAM, and a 1TB SSD. The user ran the Geekbench OpenCL test, recording a score of 72799. Since that time MacRumours has nosed around the Geekbench online result browser to find similar machines with Core i9 processors scoring 75817, 76017, and 80002. A separate benchmark of a Core i9 plus Vega 20 model on the Metal tests yielded a score of 73953. How does the above compare to the previous top configuration using a Radeon Pro 560X dGPU? MacRumours says that similar MacBook Pro 15 models with the older top configuration would score around 65000 in the OpenCL tests and approx 57000 in Metal, "suggesting much higher graphics performance with the new Radeon Pro Vega 20 card". If you are configuring a MacBook Pro 15 the high-end model starts at $2799 (£2699). For these new GPU choices the price increments are as follows; the Radeon Pro Vega 16 costs an additional $250 (£225), while the Radeon Pro Vega 20 costs an additional $350 (£315). GBP prices are not an exchange estimate but come direct from Apple's UK website. from a quick look at the Apple website, it looks as though they have split the MacBook Pro 15" into to lines, both with the same CPU, SSD, & RAM options. An unannounced refresh of the Kaby Lake-G unless I'm missing something. Same setup with Coffee Lake/Whiskey Lake bolted onto the side of a cut down Vega GPU and some integrated HBM. Previous top-end one with 24 Vega cores is on the OpenCL chart at 87517.